At the VDMA joint booth IFS presents the current version of its IFS Applications 10 ERP software. 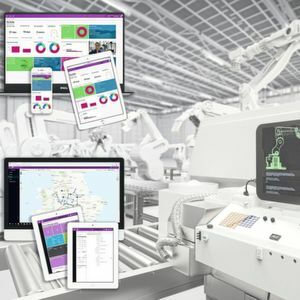 IFS Applications 10 offers an open interface based on microservices which enables simple integration of data and processes from the ERP software into IoT and AI technologies. They are also bringing with them their own AI-based chatbot. It can also be used with Skype, Skype for Business and Facebook Messenger and allows uncomplicated interaction between users and the ERP system via voice and text. IFS Aurena furthermore presents a new browser-based operating surface. It is said to supply users with the necessary information quickly and intuitively, thus guaranteeing a good user experience. This “Consumer First” approach apparently leads to workers using the ERP software more intensively and therefore even more productively. On the basis of new strategic inventory buffers, production firms can realise needs-controlled planning of materials and resources. For manufacturing industry in particular, this software is said to provide new and extended functions for traceability, for quality management, recipe and formula management, and batch balancing. Manufacturing firms can choose between various operating models and change them flexibly if required. IFS Applications 10 is available on-premises, as a managed service in the Cloud, and as software as a service. Visit IFS Deutschland GmbHat Hannover Messe in Hall 7, Booth E26. Industrial workplace 2025 Industry 4.0 – What happens to the humans? Warehouse Management Systems What is a Warehouse Management System? Definition & sources!